When CBS shortened the episode order for Numb3rs’ sixth season, the network claimed that it wasn’t a negative indication about the show’s future. With the series’ ratings in decline though, most could read between the lines. After all, how often do networks cut an episode order when they’re pleased with a TV show’s performance? As time has gone on, it’s looked more and more likely that Numb3rs wouldn’t be around next season. 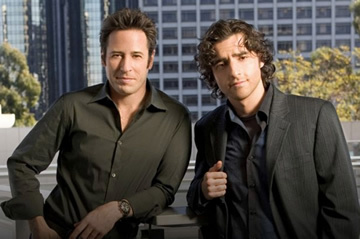 ABC and FOX were even betting on it, casting Rob Morrow and David Krumholtz in their new pilots. CBS is notoriously tight-lipped about their schedule plans until they’re announced at the upfront presentations to advertisers. We probably won’t hear about Numb3rs’ fate officially until Wednesday. What do you think? Sad to hear that Numb3rs won’t be back next season? Were you still hoping that there’d be a season seven? CBS would certainly be guilty of a quite gross injustice.